If One Cockatiel Dies, Will the Other Be Lonely? Cockatiels are never alone in the wild; they shouldn't be at home. Your cockatiel was not meant to live alone. Cockatiels thrive on social interaction, whether with human companions or other cockatiels. Upon losing a cage companion, your surviving feathered friend may exhibit grief in various ways. He needs extra care as he adjusts to the changes in his environment. Cockatiels are not solitary birds. 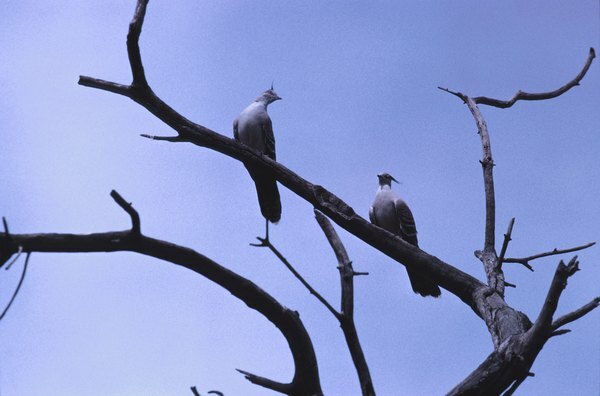 Even in the wild, they are always in pairs or flocks. A cockatiel left alone will likely be depressed. Similarly, a cockatiel whose companion bird has died is likely to exhibit grief and depression. You'll need to devote more time to the bird through touching and talking, or properly introduce another companion bird. Otherwise, depression can lead to illness and death. Cockatiels normally vocalize with chirps or loud squawking that doesn't convey stress or unhappiness. When grieving the loss of a fellow bird, though, a 'tiel may make loud, repetitive noises to convey loneliness and discontent. If your bird is left alone all day, the screaming may take place upon everyone's arrival home as your cockatiel attempts to get attention and socialization. Touch and talk to him, but be careful not to reinforce the screaming, such as by giving him a treat to quiet him. Give him attention each morning and afternoon at a routine time so he doesn't feel the need to scream to show his grief and unhappiness to the rest of the family. When a cockatiel's mate or companion dies, he may eat very little or stop eating altogether out of loneliness. While a healthy bird will typically begin eating when he gets hungry enough, a loss of weight can bring on severe weakness, then illness and even death if your little guy is not watched closely. Some loss of appetite is to be expected, but monitor closely. If it goes on too long it could cause a more serious problem. Cockatiels pluck feathers from boredom or illness, and they can begin doing it out of loneliness. This activity is common in birds mourning the loss of a mate or companion bird and can become a permanent problem. It's known as "psychological feather plucking." If your grieving cockatiel begins to pluck his feathers, he is desperate for more attention, affection and activity. You must provide these to keep him active and content until he is past his mourning period. While you can introduce another bird to keep him company, cockatiels often bond for life, so your surviving one may have nothing to do with a new cage mate. Give your friend the additional attention he craves, stroking and talking to him and having him out with the family. Make sure he has plenty of things to occupy him in his cage -- add new toys or treats frequently during this time. Parrot Feather: Why Does My Cockatiel Scream? Hamilton and District Budgerigar Inc: The Grieving Process or Do Birds Grieve? National Cockatiel Society: Pairs: Bonded, Proven or What? When Is Beak Grinding in a Cockatiel Not Normal?